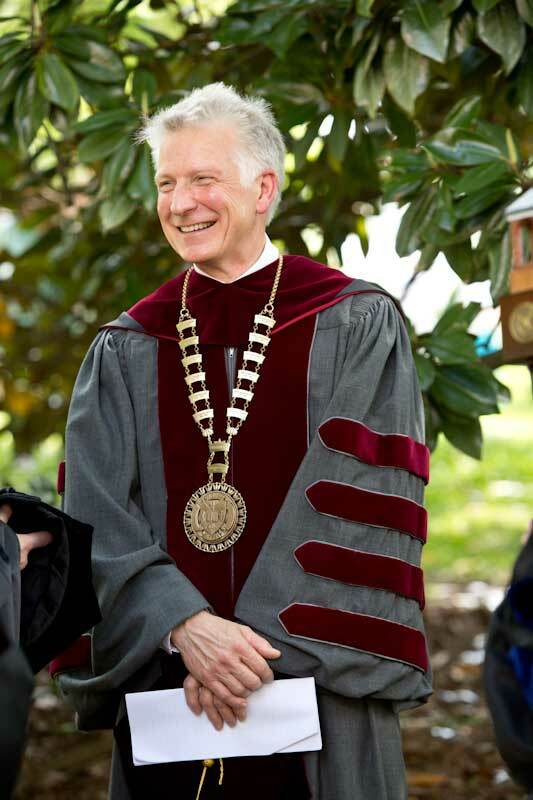 At two o'clock in the afternoon on Friday, April 28, 2017, Hampden-Sydney College inaugurated Dr. John Lawrence "Larry" Stimpert as its 25th president. The ceremony featured comments from noted historian Fergus M. Bordewich, students, alumni, faculty, and former colleagues of Dr. Stimpert. The Men's Chorus of Hampden-Sydney College and the Prince Edward County High School Band, which counts both of Dr. Stimpert's children as members, provided music for the occasion. 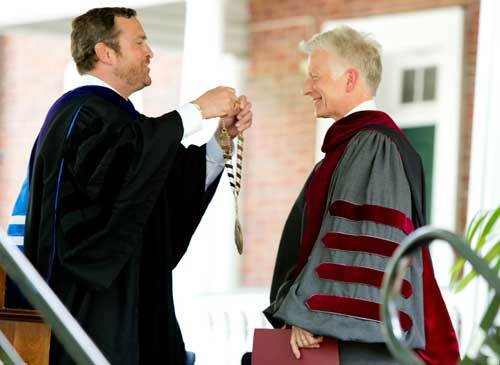 Many delegates from other colleges and universities joined the celebration Friday afternoon, processing in academic regalia with Hampden-Sydney College faculty and students from the Bell Tower to the lawn of Venable Hall. Also in attendance were previous College President Josiah Bunting III and Longwood University President W. Taylor Reveley IV. In his remarks, President Stimpert encouraged the Hampden-Sydney College community to embrace this moment of transition, just as King David encouraged his son Solomon to "be courageous and act" in 1 Chronicles 28:20. "With such an impressive past, it could be very easy for this College to fall victim to complacency, to believe that we have reached some sort of ideal state that should be enshrined. But ... our most important work lies ahead," President Stimpert said. "The last 242 years are a remarkable legacy, but they are only the preparation for the fulfillment of this College's destiny, and that destiny is limited only by our aspirations for it. Let us 'be strong and courageous, and act' on those aspirations as we together chart an ambitious future for Hampden-Sydney College." In an inaugural address titled "History and Character in Time of Trial," Mr. Bordewich likened the character and courage exhibited by this nation's founders - including Hampden-Sydney's charter trustees James Madison and Patrick Henry - to that which is needed to face today's challenges. "For almost two hundred and fifty years, Hampden-Sydney has been committed to shaping character that will endure, and not falter amidst the turbulence of the moment," Bordewich said. "Its ancient and noble mission to form good men and good citizens is today more urgently needed than ever, as we navigate the personal and public challenges that will inescapably emerge to confront us as our lived history unfolds. Its commitment to teaching and embodying the values of mutual respect, open-mindedness, clear reasoning, and clear language are the blood and sinews of our society. Civility will never become obsolete. Nobility of spirit doesn't rust. Honor doesn't grow feeble with age. These benchmarks of Hampden-Sydney's purpose will remain forever vital not just to the molding of its graduates' character, but to that of the nation." Dr. Dennis Stevens, Hampden-Sydney's provost, presided over the ceremony, and M. Peebles Harrison '89, chairman of the College's Board of Trustees, administered the investiture of President Stimpert.